In Taliya.Date.Com, Taliya Finkel turns the camera on herself and her journey through the precarious world of internet dating. Aided by a mouse, a keyboard and Photoshop tricks, she sets out to find true love. With the guidance of her cynical, gay flat-mate, Oded, she goes from date to date and hope to humiliation in Tel Aviv, drinking 45 cups of coffee and getting involved with a few men and a puppy along the way. Taliya experiences the bizarre and banal aspects of dating in the modern age and provides an often funny portrait of looking for romance on the internet, now a part of every single person's search for love. 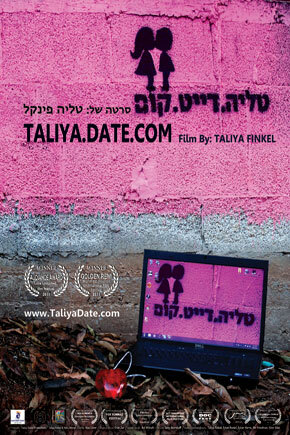 A romantic comedy with a feminist tinge, Taliya.Date.Com lays bare the chaotic world of internet dating for us all to see. Finkel is an independent filmmaker & visual artist. All her films were broadcast in the Israeli Documentary channel 8, and in prestigious film festivals world wide (Such as IDFA, San Francisco documentary, Jerusalem, Documenta Madrid) and won some prizes. Currently she lives and works in Vienna, Austria.